The entire family will enjoy the more than 200 low-carb, low-fat, healthy recipes in this book. Each Busy People's recipe contains 7 ingredients or less and can be prepared in 30 minutes or less. 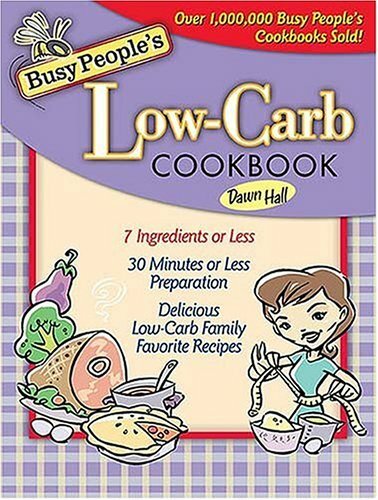 Busy People's Low Carb Cookbook is the answer for everyone who wants to embrace the low-carb lifestyle but still wants enough variety to stay on the program and keep everyone happy! Dawn Hall takes low carb beyond steak and broccoli and bacon and eggs to a full line of dishes for every meal. From creative egg casseroles for breakfast to an elegant and easy dinner perfect for company, this is the cookbook to make low-carb livable. Using her signature 7 ingredients or less and 30 minutes or less preparation plan, Hall meets the needs of every time-stressed cook concerned with feeding a hungry family, and watching their waistlines.